Assassin Artemis Entreri whisks his kidnapped victim, Regis the halfling, south to Calimport and into Pasha Pook's vengeful hands. If Pook can control the magical panther Guenhwyvar, Regis will die in a real game of cat and mouse. Using an enchanted mask, dark elf Drizzt Do'Urden hides his heritage and races with the barbarian Wulfgar to save their light-fingered friend. An unexpected ally arrives just as Entreri springs a trap. But can Regis survive unscathed? The companions from Icewind Dale battle pirates on the famed Sword Coast, brave the deserts of Calimshan, and fight monsters from other planes to resuce their friend . . . and themselves. 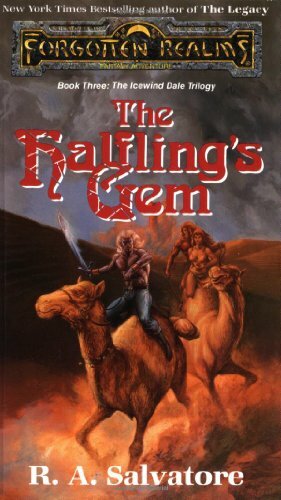 The Halfling's Gem is R.A. Salvatore's exciting conclusion to the Icewind Dale Trilogy, set in the Forgotten Realms fantasy world.